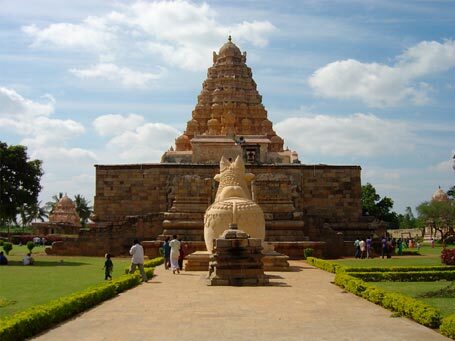 The temple is located at the center of the Gangaikondacholapuram city and occupies around 6 acres of land. Gangaikondacholapuram city now in the Udaiyarpalayam taluk of Tiruchi district was erected as the capital of the Cholas by Rajendra I, the son and successor of Rajaraja I, the great Chola who conquered a large area in South India at the beginning of the 11th century A.D. The temple consists of 3 stories and surrounded by a huge fort like wall, the outer wall was greatly destructed during the English rule (1896 A.D) to reuse the building material (Granite rocks) for constructing the Lower Anicut (Dam across river Kollidam).